This case does not comes with foam in the bottom or the lid of the case, this is an empty case. This case comes with sheets of foam in the bottom and a piece of convoluted foam in the lid of the case to fill up the interior of the case with foam. Lightweight and rugged, the Pelican Storm Case is the result of years of perfecting and testing in both the laboratory and the field. From the proprietary HPX plastic resin that is tough during low temperature impact testing, to the patented Press & Pull latch that opens easily. Every facet of these lightweight cases has been created to defend your vital gear. Designed with double-layered soft grip handles and a vortex pressure relief valve, these airtight and watertight cases will protect whatever is stored inside of them under any conditions. This case has two built in recessed edge casters and retractable extension handle for easy transportation. 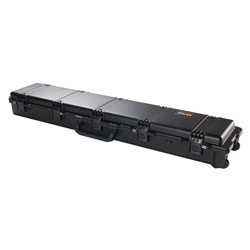 This case is protected by Pelican's Lifetime Guarantee of Excellence. Interior Dimensions54.50" x 10.00" x 6.00"
Exterior Dimensions57.74" x 12.71" x 6.67"
Shipping Dimensions59" x 14" x 8"